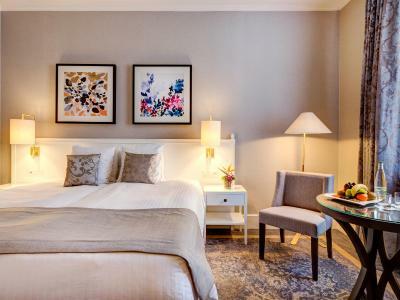 Lock in a great price for Fairmont Le Montreux Palace – rated 9.1 by recent guests! The friendly and warm staff greeted us, from the valet to the front reception to the spa/gym staff, and that set the tone for the rest of our stay. We heavily weigh the warmth of staff at places we go to and Fairmont was absolutely wonderful -- no exceptions. We had requested a lake view room on a higher floor, which they granted. The room was spacious enough (not huge) but well-appointed with a magnificent view of the lake and Alps. Water pressure was good and toiletries were Molton Brown. Bed was very comfortable and there were additional amenities, like a Nespresso machine, which my husband definitely appreciated. The spa/pool area were nice but could get a little bit crowded. We were very pleasantly surprised by the machines in the gym though! 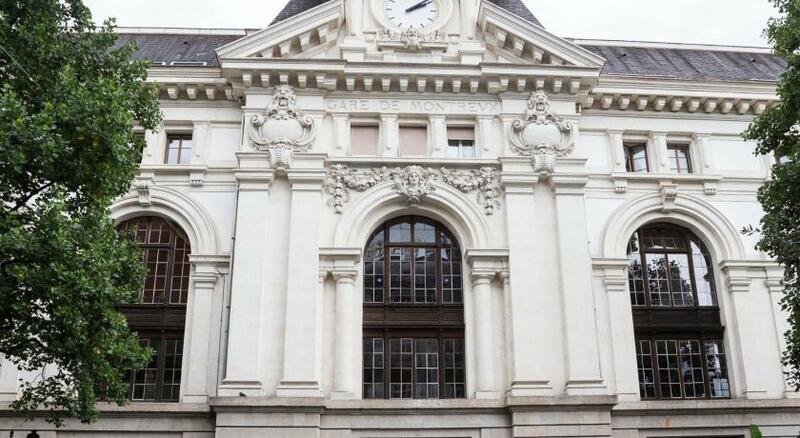 The hotel location was directly next to the lake and about 5-7 min walk to the Montreux Gare train station, which made it easy to visit nearby towns. i really like the lake view from my room which was very beautiful, also the staff were very friendly to help us and more. We stayed here for our wedding anniversary and it was wonderful - the staff were fantastic and there were lots of wonderful little touches, from complimentary cake and sweets waiting for us in our room, with a special message wishing us well. Perfect lakeside location. 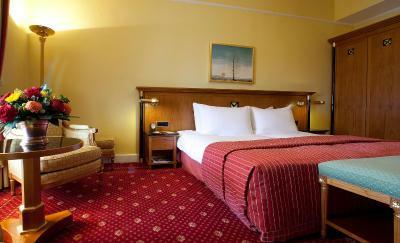 Comfortable large rooms and wide spacious corridors. Enjoyed bedroom balcony. Very good breakfast. Very helpful staff. The indoor and outdoor pool and the breakfast area. The room size and spacious common areas. The hotel restaurant Montreux Jazz cafe which had excellent service. Staff in general are helpful and have a friendly attitude. Great views of the surrounding mountains. The breakfast buffet was exquisite. Towel warmers if you like them. A refrigerator in your room to keep your drinks and chocolate cold. 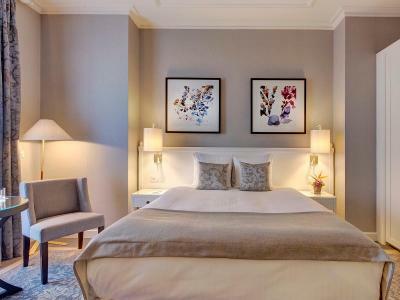 Fairmont Le Montreux Palace This rating is a reflection of how the property compares to the industry standard when it comes to price, facilities and services available. It's based on a self-evaluation by the property. Use this rating to help choose your stay! 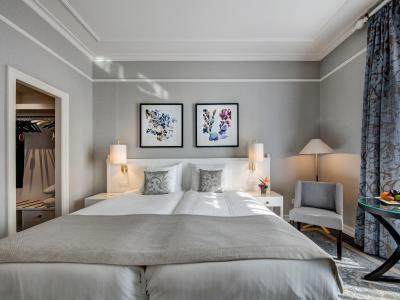 Fairmont Le Montreux Palace, 'The Pearl of the Swiss Riviera', is located on the shores of Lake Geneva with magnificent views of the lake and the Alps. 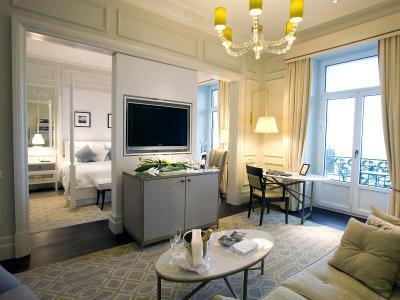 Built in 1906, the Fairmont hotel offers a traditional and elegant atmosphere combined with the latest technology. 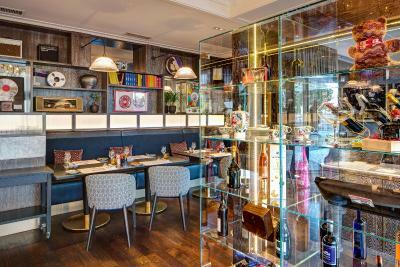 Featuring refined yet relaxed dining spaces, MP’S Bar & Grill includes an outdoor terrace and a cocktail bar. The menu reflects a passionate faith in the finest local produce including the regions best wines. Offering simple, gourmet food coupled with and an unpretentious atmosphere, Funky Claude’s Bar is a great place to drop by or hang out late into the night. 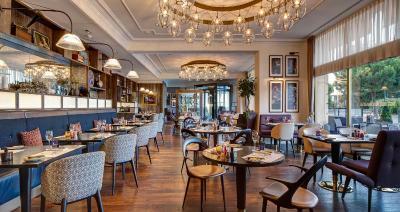 The Lounge offers a light breakfast selection, snacks during the day and pre-dinner drinks in the evening. 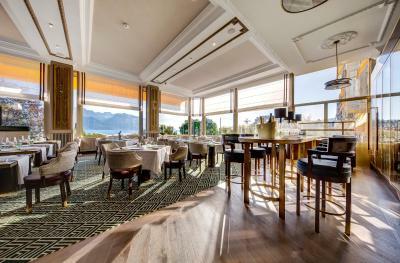 And in summer La Terrasse du Petit Palais offers a Mediterranean cuisine with a breathtaking view over the Lake and the Alps. 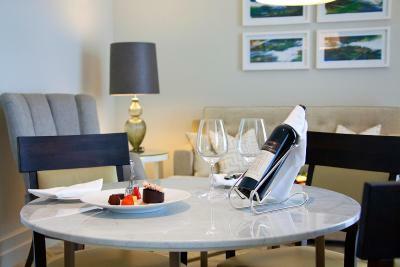 The in-room dining service is available 24 hours a day. 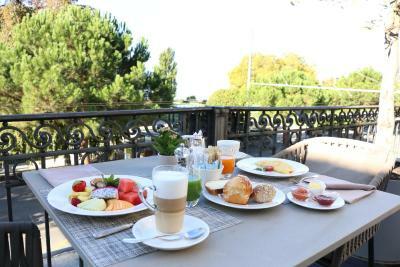 The breakfast buffet is served in the winter garden, offering great views over the Lake Geneva and the Alps. A small terrace is available during summer. Enjoy the fitness, health and wellness facilities in the 6562 ft² Willow Stream Spa. Access to the Willow Stream Spa is included in the room rate. It offers an indoor swimming pool, a hot tub, fitness room, sauna and hammam. In the summer time, the outdoor pool invites you for a swim, while the large garden is the right place to relax. 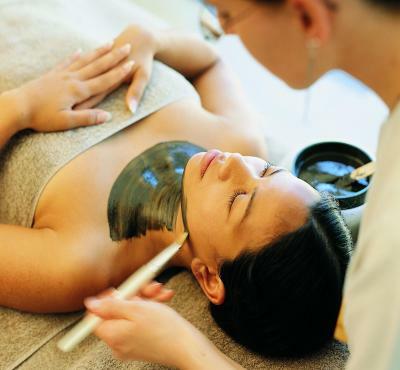 An extensive program of massages as well as face and body treatments are available (at additional charge). Located in the heart of Montreux, the position of Fairmont Le Montreux Palace is an excellent starting point for any excursions, eg. to the Chillon Castle, to various museums, the village of Vevey or to the close-by mountains. 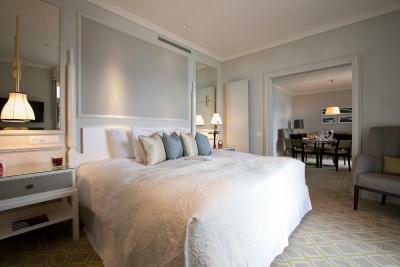 When would you like to stay at Fairmont Le Montreux Palace? These rooms are decorated in a red and gold décor and feature city views. They offer a flat-screen TV, a desk, an Ipad directory, cofee making facilities and a bathroom with a spa bath and free deluxe toiletries. - Connecting rooms are not possible within this category. - Extra beds/children's cots are not possible in these rooms. Private parking is available on site (reservation is not needed) and costs CHF 48 per day. 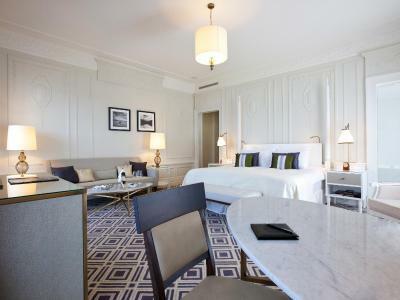 Fairmont rooms are renovated guest rooms in elegant and modern décor, overlooking the Lake Geneva and the Alps. Some rooms have a balcony. All rooms feature a flat-screen TV, a desk, an Ipad directory, coffee making facilities and a bathroom with free deluxe toiletries. Please note that extra beds/children's cots are not possible in these rooms. 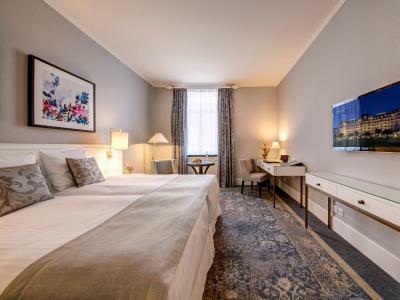 Spacious room overlooking Lake Geneva and the Alps. 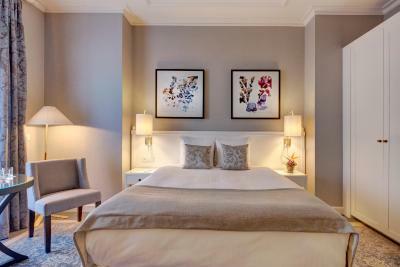 Most of these renovated rooms feature a balcony and all of them offer a flat-screen TV, a desk, an Ipad directory, coffee making facilities and a large bathroom with free deluxe toiletries. 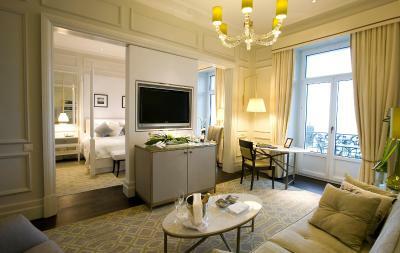 Luxurious open-plan suites with sleeping and seating area. 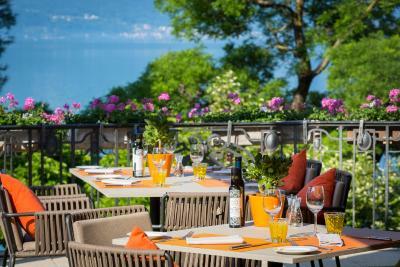 They offer a large marble bathroom and a balcony overlooking the Lake Leman and the Alps. The rooms are equipped with a flat-screen TV, a desk, an iPad directory, coffee making facilities and a large bathroom with free deluxe toiletries. 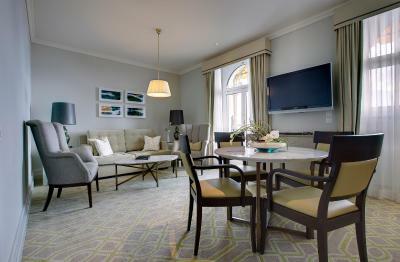 Spacious suites with a bedroom and a separate living room. They are furbished in an elegant and luxurious contemporary design, and offer a balcony overlooking the Lake Leman and the Alps. All rooms feature a flat-screen TV, a desk, an iPad directory, coffee making facilities and a large bathroom with free deluxe toiletries. This room offers views of Montreux and the Swiss Alps and comes with a flat-screen TV, desk, iPad directory and coffee station. The private bathroom is fitted with a walk-in shower and free toiletries. 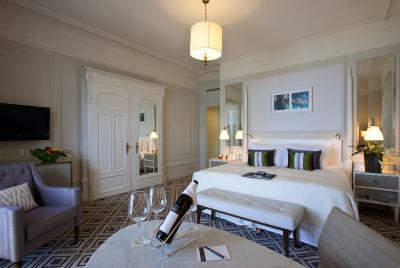 More spacious room with a contemporary and elegant design, overlooking Lake Geneva and the Alps. These rooms have a lounge area and a balcony or a veranda and feature a flat-screen TV, a desk, an Ipad directory, coffee making facilities and a large bathroom with free deluxe toiletries. Montreux: a luxury destination. Home to the famous Jazz Festival and the celebrated Christmas Market. 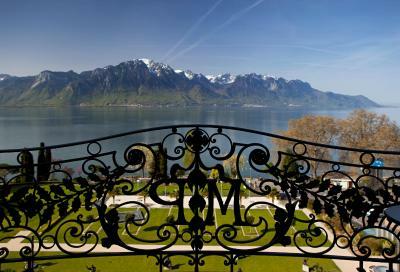 Fairmont Le Montreux Palace is situated on the shores of Lake Geneva, overlooking the Alps. Built in 1906, this Jewel of Belle-Époque architecture offers an elegant atmosphere, along with attentive service in true Swiss style. Fairmont Le Montreux Palace is a unique five-star palace; member of Leading Hotels of the World and Suisse Deluxe Hotels. In addition to being one of the most prestigious, Fairmont le Montreux Palace is one of the largest hotels in the Swiss Riviera. 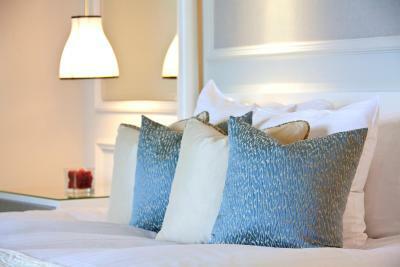 It offers 236 rooms & suites that are luxuriously furnished and equipped with the latest technology. 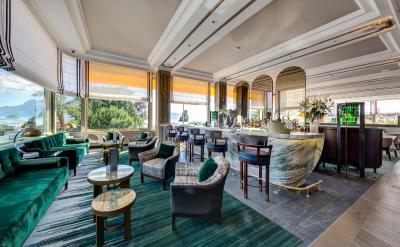 Our guests in Montreux can experience an epicurean journey around the world with our distinct dining venues: MP’s Bar & Grill, Montreux Jazz Café, Funky Claude’s Bar, The Lounge and La Terrasse du Petit Palais. After such comfort food, you will enjoy our wellness facilities at our signature Willow Stream Spa. The resort also boasts 15,000 square feet of exclusive ballroom and conference space, and is close to the 2M2C. 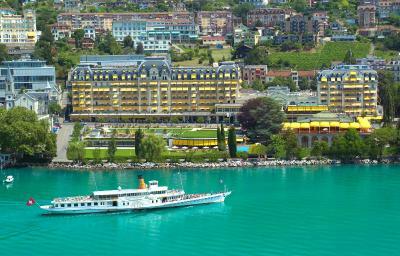 Fairmont le Montreux Palace has become the destination for unforgettable weddings and proposals. 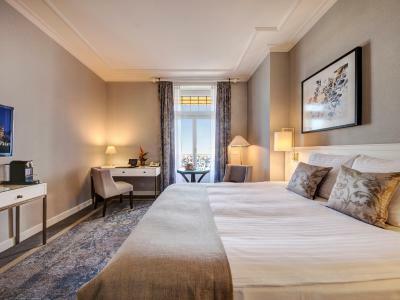 House Rules Fairmont Le Montreux Palace takes special requests – add in the next step! 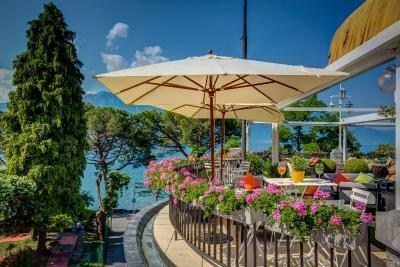 Fairmont Le Montreux Palace accepts these cards and reserves the right to temporarily hold an amount prior to arrival. Please note that children are welcome in the Willow Stream Spa only between 14:00 and 18:00 from Monday-Saturday, and between 09:00-12:00 and 15:00-18:00 on Sundays. They need to be accompanied by an adult. For further information, please contact the property directly. Contact details are stated in the booking confirmation. Room is kind of small. Room is Clean and comfortable. 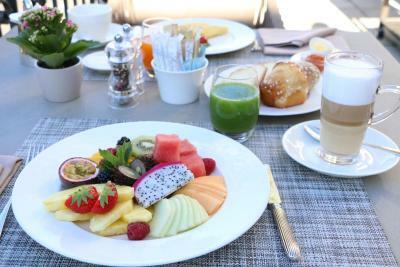 The breakfast was nice and the dining area is attractive. Service a bit slow, staff seemed bored and not very attentive, especially at breakfast. For such a hotel, I had expected them to go the extra mile. Hotel staff old fashion type employee from front door, front seat concierge however housekeeper are good. They should learn from non brand hotels. And this what I observed during my stay. I’m not sure if I’m only rare case or others observe the same. But time for check in and check out long process. Even the way of asking deposit is old fashion only I place they asked was here. The bathroom was modern but could get VERY warm because of the radiator (even if you turn it to low, it would still get ridiculously hot because the radiator was directly next to the toilet). Valet parking is $48/day, which is quite pricey in our opinion. Location and old world charm. Staff are amazing. Airconditioning in the room did not work and was not/could not be, repaired while we were there. While we were not there in summer, at times at night the room got a little stuffy and warm, so we would have liked to put on the aircon but as indicated, it didn’t work. So we had to open up the doors to the balcony, which meant that even though the external shutters were down, we still got some traffic noise into the room, which wasn’t ideal. Also, our towel warming rail didn’t work, and they didn’t/ couldn’t fix that either! The rooms are spacious and super comfortable and very nice and clean. The location is best In Switzerland. Staff are super helpful and professional. Restaurants and food is superb. Room very spacious and comfortable.. very clean.. best location on the Lake and close to restaurants and shopping area. All staff are kind and professional. Breakfast buffet Is super . Valet service is excellent and fast. Everything about this hotel is amazing I've been coming here every year to spend my vacation for the past 4 years. Everything was quite busy since we were there Christmas time; couldn’t get a booking for the Christmas brunch either coz it was sold out way before. Nothing. It’s not cheap but in Mi treuxnorhing is. My favourite hotel and at Christmas it looks like a dream too. Love the new room decor - slightly more modern and Farriw & Ball-esque. As always the staff at reception could not have been nicer. A bit more mixed at breakfast but on Sunday morning I could see why.